Cruftbox Cruftbox: Cookies on a grill? The weather is hot here Los Angeles in the summer. So hot, we don't want to turn on our oven. But we do want cookies. Michele convinced me to try baking cookies on the grill. It works in theory, so I gave it a shot. We used some premade cookie dough on a baking sheet with parchment paper. 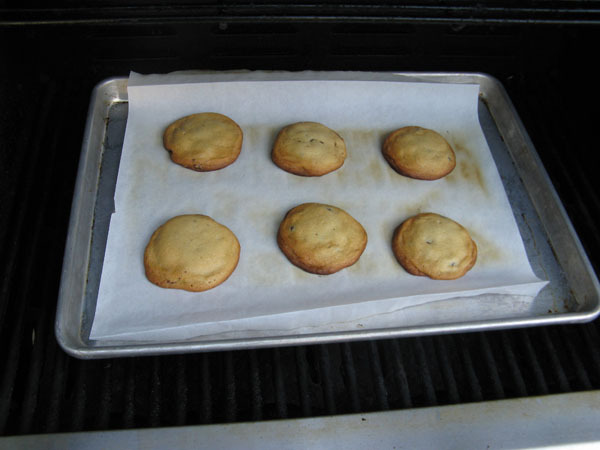 Parchment paper is essential to proper baking. I pre-heated the grill to about 325°. The cooking instructions call for 13 minutes at 350°. I figured that a little low wouldn't hurt. After I placed the cookie sheet inside I checked the temperature and it was down to 300°, not bad. After 12 minutes I went out to check. 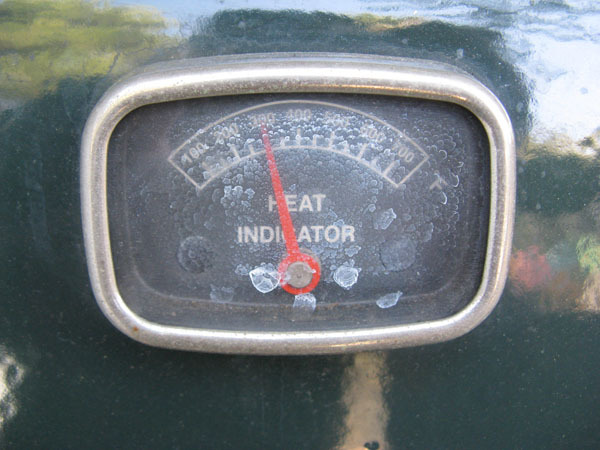 Opening the grill sooner to check would have released heat. They didn't look bad. The temp had gotten up to 400° though, higher than I wanted. 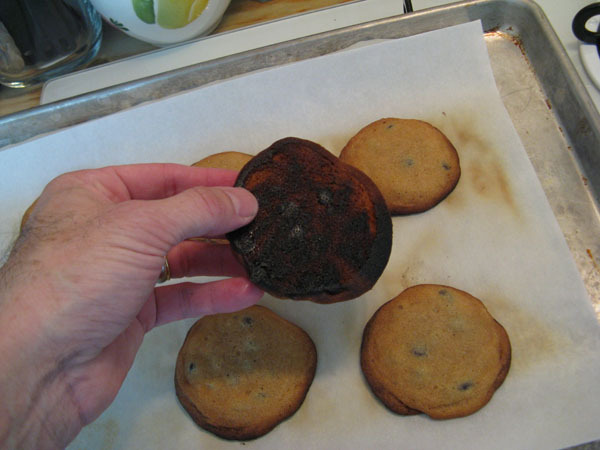 The cookies were edible, but a little burnt on the bottom, likely to the direct heat and higher temperature. I have a few options to try such as using bricks to raise the sheet away from the gas burners and monitor the temp during the baking to keep it under 350°. Any other suggestions? Awesome! I want a cookie now. One of those non-stick silicone baking mats (silpat) might provide enough insulation to keep the bottoms from over-browning. 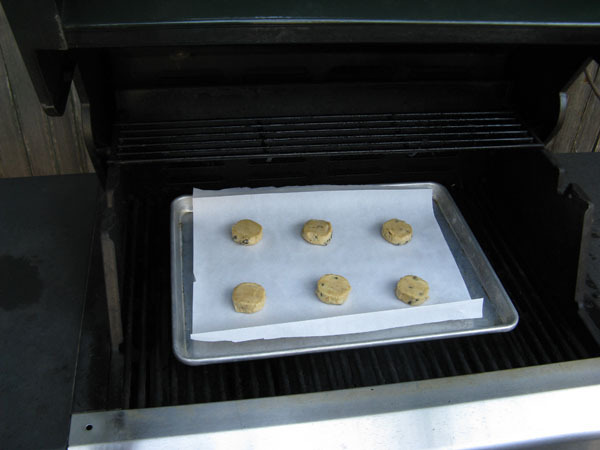 Maybe align the cookies along one edge of the sheet and only fire the opposite burner as well to reduce the amount of radiant heat. 3. When you desire a cookie, bake a few in the toaster oven shown directly behind the bag of cookie dough in the first picture. The problem was a pan bottom too hot. You want to look for insulation, someway to keep the bottom cooler while the radiant heat has time to cook the tops. 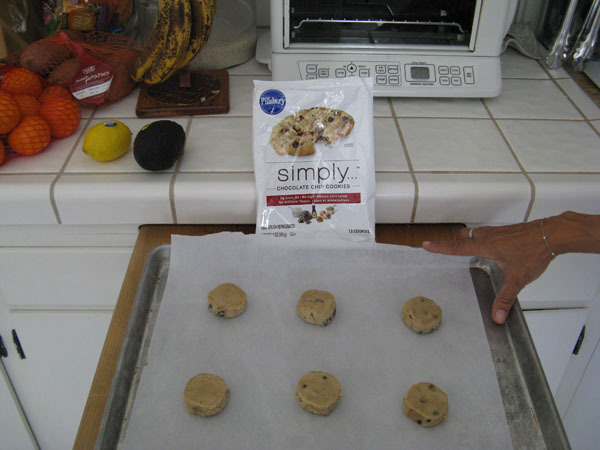 - Make a cookie tray sandwich of two or three pans stacked, maybe with a silicon pad in between. Anything to keep the heat away from the cookie bottom until the end. If you have four burners, try keeping the middle ones on low to off, with the side burners on the medium to high setting. This results in indirect heat that is more even. We were bored at home last week and decided to try cooking a whole turkey on our grill and it was about 90% successful, kind of like those cookies.